This project began as a simple question: what *do* pastors do on a random day of ministry? What if we could all tweet about our days and find out? What incredible diversity and little moments of ministry could we unearth? Hence this project. While it has been criticized as self-congratulatory, self-justificating, or simply a waste of time better spent in prayer, the purpose was not to promote ourselves but to educate the public about what pastors do all day. For the Methodists it was a throwback to Wesleyan Holy Clubs who would chronicle their day in 15 minute increments. And it was fun. Thanks to twitter/facebook grassroots promotions, the UMNS News Service, and even UMC.org, this project got onto people’s radars and into their routines yesterday. And #pastors24 became a way for pastors to connect and people on the outside to get a glimpse into a typical pastor’s day. From those parameters, there were 1050 tweets that were included in the data below. There were ~72 pastors and ministry people who participated. While there were 107 people who tweeted the hashtag, some were RT-ing or asking questions and didn’t participate. So this is every person with at least 3 tweets. There were 1050 updates sent by pastors participating in this project. This is a rough number. It does include some misspelled tweets (ie. #pastor24), but not every tweet appears in twitter’s search function. At one point, we were a trending topic in Atlanta, meaning out of all the tweets coming from Atlanta, we were in the top 10. Wild. 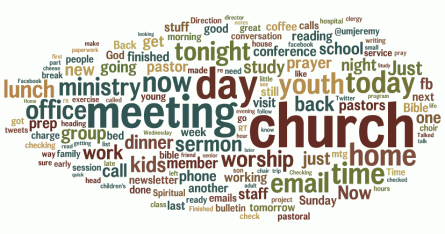 Meetings are one of the top words pastors used. Whether it is meeting with a student, parent, committee, teacher, youth…we are meeting a lot. There’s a lot of “youth” mentions which is powerful. It may be a bit swayed since at least 2 of the participants are in children’s and youth ministry, but still neat. A lot of pastors do work on meetings, worship, bible studies the day-of. A large number of pastors were actively working on their evening programs the day it was to happen. This isn’t a criticism just something I noticed. Many pastors worked 12-13 hour days, even if the first/last hours were doing computer work. Really the best way to get a glimpse of pastors’ days is to go to the #pastors24 stream and scroll. Click on a name and scroll through their tweets from yesterday. Amazing, huh? I would love to hear how others experienced this. Can you comment below and let us know your experience? Were you more intentional yesterday? In what way? Did you feel more connected to other pastors yesterday? Why? Any other pastors in particular? What trends or common updates did you see yesterday? Thanks to the participants for taking the time to educate the world about our day. I was going to do more, but I lost my interwebs. Do it again. Please. This was fascinating and made me feel less like a lone ranger. I don’t think I was more intentional in any way yesterday, except in tweeting. That was pretty much most of my day, and it’s pretty typically of my Monday-Thursdays. I didn’t provide little details, or even a blow by blow account, just noted things as I could. Most of my day is get started with one project, have someone come in the office, go back to project, phone rings, go back to project, realize I need to work on another project first, get side tracked with what I am supposed to be doing, pray for clarity, work on project, someone comes in my office…I don’t think I am alone in this. And by project I mean anything from working on sermon planning, to getting things ready for a meeting, working on a Bible study, working on a presentation, etc. But it’s all good. It all happens. And it’s all for God’s Kingdom. I don’t think I was more intentional yesterday than any other day. A couple of things stood out. 1) Interruptions throw me for a loop. I had three of them yesterday that needed immediate attention. One was personal (kid-related) and two were related to our church construction. I probably need to find better ways to deal with these. 2) The lines between work & non-work get blurry in some ways. For instance, I’m in a community theater play, not only because I like to do it, but because it puts me out in the community with some different persons than I might normally be with. While I don’t really consider it “work” it’s definitely meets the “engaged in community” part of my job description. I’m sure other clergy struggle with these issues as well. This was fun. I was more intentional about tweeting what I was doing, but yesterday did not reflect a typical day either. I actually had more free time than I normally do, so that was odd. I enjoyed reading other pastor’s tweets too because it was uplifting to see the body of Christ at work. Thank you! oops, I’m totally verbose. surprise. I have a blog post stewing about my reflections and I’ll link to this and your initial post so you can read it. Then we’ll swap readers back and forth. Then we’ll get *those* posts on umc.org. Then the whole of the online Methodist connection will be ours to control Mwahahaha! No, seriously, then people will be talking about what ministry is and the exciting things pastors and ministers of all types do, and how so much of it is transformative (and quite a bit of it is silly and administrative too). And we can perhaps offer our own mini commentary on what effective ministry is and where individuals are meeting the holy in their vocations and in their everyday lives. Oh, and you’re awesome. I’m so happy to be your colleague, and through this project to meet some other awesome colleagues too. Jeremy – you are right about my last couple tweets “sounding raw” but intending to be reflective; I was debating hitting “send” on both of them, especially the “sometimes i wonder why…” By the end of the day I was tried, holding on to some anxiety, and just wanting to express that sense that while I love this calling it isn’t always fun and sometimes doesn’t feel all that productive, but maybe I was listening to that inner drama queen a little too much. I was a little more intentional about tracking the course of my day, and to a degree I think that kept me a little more accountable, which was good. Typically I don’t track mileage, although I’ve been increasingly mindful of the amount of time I’ve been spending in the car with this new appointment, so yesterday’s exercise gave me a reason to attach a number to that aspect of the work. I felt a little more “connected” because of this – mostly in the sense that “Okay, I’m not completely crazy, others are trying to figure out this ministry time, family time, personal time, thing, too.” I did start following @pastorbecca, partly because she was putting a lot of good stuff up, partly because she reposted a friend’s sermon on her blog, which makes her pretty awesome in my mind. Thanks again, for putting this thing together. mjmm, I loved the honesty of your tweets, and the mix of exhaustion and thanksgiving. I debated a bit on whether to participate since I’m not a pastor currently but a pastoral counselor. I do quite a bit of work (mostly unpaid) for the church I’m appointed to, the church where I have my 2nd counseling office (where I was yesterday) and other churches and faith-based non-profit organizations. I (obviously) ultimately came down on the “yes” of doing it, because some aspects of my work are very similar to that of pastors, and other aspects are different enough that I believed I could represent some variety in ministerial work. The work of a pastoral counselor/deacon can be lonely sometimes. Heck, most pastors I know feel lonely from time to time, but when I gather with clergy in my conference, I sometimes feel lonely even among the pastors who know from loneliness, because sometimes I erroneously think my work is so different from that of pastors. Participating yesterday, reading so many pastors sharing the same thoughts and feelings about their job as I do, helped me feel much more connected to my colleagues in ministry. Also thanks for putting together all the data Jeremy. I am a Myers-Briggs J and just love seeing all of that data! I tweeted with the church tweet yesterday( Green Lake UMC), and actually found this exercise a bit like the insurance tracking device I wear constantly. Yes, it keeps me accountable, and often focused, however, it also took much time that may have been better utilized elsewhere. I can identify with what some have called the clergy loneliness factor and think that even though I appreciate all this technology and social networking that I miss out on so much because I’ve become disengaged from more direct forms of communication and personal contact. This is not a clergy thing, it is a cultural problem, when over 1/2 the couples are now meeting online, this is a lonely world. I think the encouragement of institutions, including church, to use more and more technological distancing techniques, is like giving an alcoholic a bottle of gin. I use the computer to write and research for worship, I use facebook to connect with congregation members, I use e-mail to conduct business……It was fun, but at the end, I felt like I was drawn into something I’m trying to move away from. I would prefer to be drawn into face-to-face contact, fullness relationship with others as I grow in relationship with God. I have to say, when I read your first post I was excited. Less to prove something to someone, than to share in what ministry means, to give an example of what we do, and as a chance to see what I do throughout the day. I’ve been told I need more balance and work too much–but I don’t feel like I’m doing any more or less than others. It was enlightening to see that on a day I felt was “empty” (there was litterally NOTHING written on my calendar) that I did so much. It both helped me look at all the people I’ve touched and relish today as a planned day off. I felt much less guilty about spending 5 hours cleaning my own house! With all that said, I read some of the posts where others thought the idea was silly or self-serving. One written by a pastor I love and respect. I have to be honest, I thought about stopping. But, I to me it wasn’t about proving myself to others. It was about finding out new things for me. I was amazed how many people commented about things. I was amazed at how many new interesting people I met. I was amazed at how much ministry was happening. So, yes, it was self-serving. But clearly, I’m not self-serving enough. In the end, I think my day of self-servingness will reap benefits on how I minister, how I care for myself, and how I care for others. Blessings to all. Praying that you are strengthened and that you continue to spread the light and love of Christ to all the world. With God’s help, I still believe we can change the world–one prayer or maybe tweet at a time! While I didnt participate directly (not one in ministry), I did check in and watch the feed through out the day. Coming from multiple clergy-filled households I felt i had a pretty good idea of the daily life. That being said, watching the feed was a solid reminder of not just the length of the day for ministerial types, but the potentially brutal personal toll. Its unfortunate there was criticism. But I suppose some folks are simply wrong sometimes. 🙂 I appreciate the view into the life of those in direct ministry and hope yall host this again. Additionally, very glad to see a good handful of North Georgia UM folk involved! Thank you, Jeremy! And yes, pastors24 was a trending topic in Atlanta for nearly four and a half hours in the morning. Very cool project man! Wish I had been aware. woulda loved to participate. Although Presbyterian, loved the concept. Maybe do it once a month on the 24th? ?